Do You Love Much Or Little? In Luke 7:36-50 there is a story about a Pharisee named Simon, a “sinful woman,” and Jesus. It starts out with Simon inviting Jesus to his house for what appears to be a dinner party. We don’t know Simon’s exact motivations. Being a Pharisee, we may be quick to ascribe to Simon nefarious reasons for inviting Jesus to his house. While many Pharisees did doubt in Jesus, and try to trap him in religious conundrums, some Pharisees seem to have at least been open to listening to Jesus. Nicodemus in the 3rd chapter of John comes to mind. He was a Pharisee who came to Jesus to find out for himself who Jesus was. I feel a little inclined to give Simon the same benefit of the doubt. He invites Jesus over to his house to eat and converse with him. Perhaps Simon wanted to see and talk with Jesus firsthand, and come to his own conclusions after. That is certainly a laudable effort as opposed to dismissing Jesus without investigating. At the very least, Simon is willing to listen to Jesus. Luke then informs us of a “woman of the city, who was a sinner.” In my mind, he is very kind to this woman, because he does not come out and directly say what kind of sinner she is. But all signs point to this woman being a prostitute. She has an alabaster flask of ointment, probably something she used in her “trade.” And judging by the reactions she later elicits, she seems to be well known for her sins. 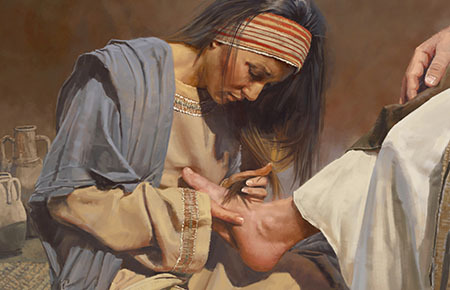 Somehow this woman learns that Jesus is at the house of Simon, she is able to get into his house, and she begins anointing Jesus’ feet with the ointment and her tears, and she then wipes his feet with her hair. During this time period and in that part of the world, people ate at very short tables, and they would recline on their sides on the floor or a couch with their feet pointed outward and away. So you can picture Jesus and Simon and probably some other important or influential men all reclining around Simon’s table. Perhaps they are discussing religious things, asking Jesus questions. All of the sudden, this woman who everyone knows to be a grievous sinner begins this overt show of emotion toward Jesus’ feet. She anoints him with ointment that also has bad connotations with it. And Jesus does nothing. He allows it to happen. I wonder if Jesus just keeps on eating as if nothing is happening. You can almost hear the room come to a complete silence save the sounds of this woman sobbing, everyone at the table waiting to see what Jesus will do. Simon thinks to himself that obviously this means Jesus isn’t a prophet. This seems to have been Simon’s motivation for inviting Jesus. He was looking for proof that Jesus was a prophet. But if Jesus were a prophet, he would know what kind of woman was touching him. The implication in Simon’s mind being that obviously a man of God would never allow himself to be touched by such a vile and sinful person as this woman. And as Simon is mulling this about in his mind, Jesus begins to speak. It seems to be completely unrelated to the events that are taking place. Jesus tells Simon a story about a moneylender with two debtors. One owed 500 denarii, the other 50 denarii. The moneylender then canceled both debts because neither debtor could pay. Jesus’ question to Simon was this: “Which of them will love him more?” Now just imagine this scene. The room is silent, fixated on what is happening behind Jesus. Then Jesus, when he does speak, tells this strange little parable. How odd it must have been! Simon answers, the one who was forgiven more. And Jesus says he was right. Then Jesus says to Simon, “Do you see this woman?” This is quite something to say. Nobody can take their eyes off this woman. She is causing a scene. Everything else has stopped, everyone else is waiting for Jesus to do something or say something about it. Everyone sees this woman. But they don’t really see her, do they? They see “a sinner,” someone who doesn’t belong, someone who a prophet of God could never care about, someone who should not be making a scene. But they don’t see her. So the question I want to leave you with, is: How much do you love Jesus?